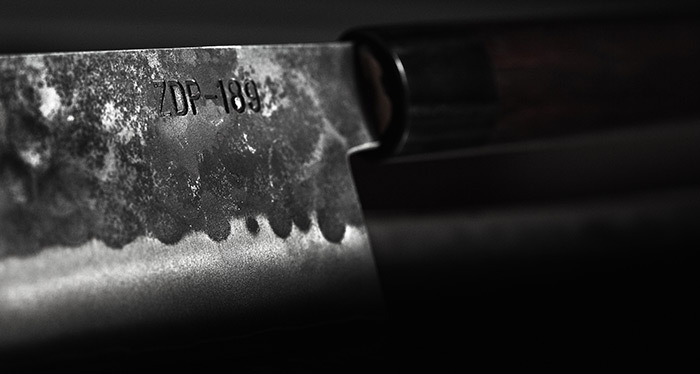 The latest addition to our range is a ZDP-189 kitchen knife that uniquely combines Japanese traditions in the manufacture and maintenance of steel knives with contemporary Western gastronomy. It embodies the cream of the crop as regards what one desires in a kitchen knife: the best steel, a multi-purpose profile, excellent functionality, and an attractive look. This makes it an ideal choice for anyone looking for a selection of the best properties for versatile use. Its superior qualities will excel in a professional environment with a large volume of work – as well in the home. 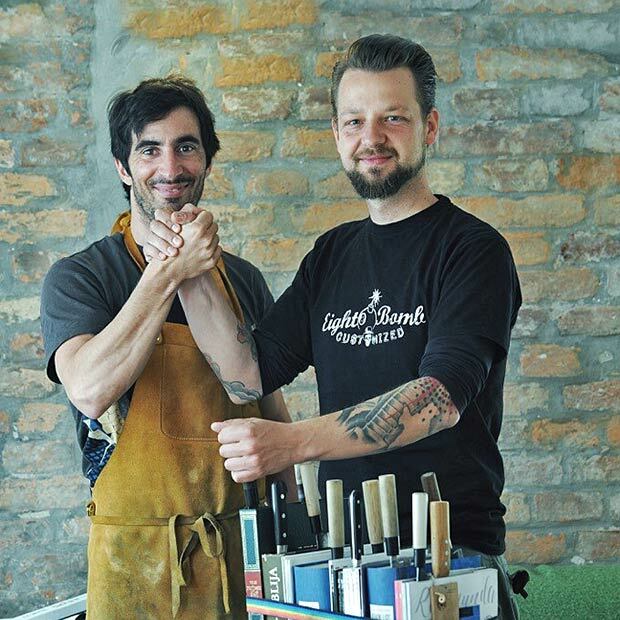 We designed the ZDP-189 kitchen knife together with Bine Volčič, one of the most recognisable chefs in Slovenia, in particular due to his comprehensive knowledge of Japanese knives, his passion for working with them, and our previous experience testing knives together. The knife was designed in harmony with our values, i.e. excellence, quality, and reliability, which could be said to originate in the steadfast Japanese tradition. We also devoted special attention to certain aesthetics inspired by Japanese mysticism and a respectful attitude to tradition, nature, raw materials, the constituent elements, and the final product – in short, the quintessential values of Japanese culture. We begin discovering the pleasure of cooking when a sharp blade brings a certain simplicity and lightness of cutting or mincing to our kitchen, inescapably infusing elegance into our movements and adding an edge to our cooking experience. What we also expect from a knife is long-lasting sharpness, a stainless steel blade, and simple maintenance. And as we expand our cooking knowledge and supply our pantry with fresh and wholesome ingredients, we become increasingly interested in high-quality food preparation. That is inevitably when the true meaning of a blade’s sharpness is revealed. 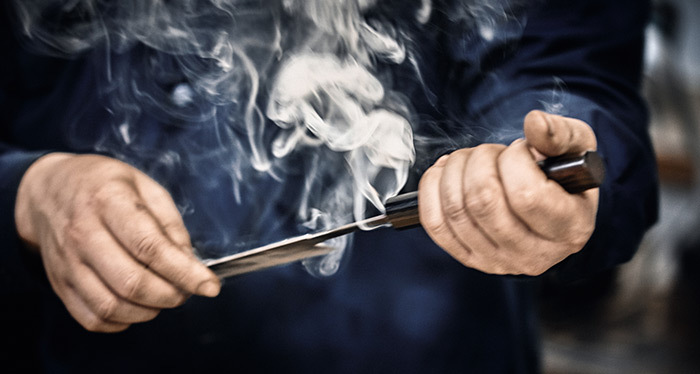 The perception of sharpness in Japan probably holds the key as to why it is precisely Japanese knives that are the first choice of chefs around the globe. To the Japanese, sharpness traditionally entails the concept of taste and freshness, which also explains their primary goal in maintaining a blade’s sharpness – to cause the least damage to the cell walls in meat and vegetables. This is the only way to reduce the loss of the succulent ingredients in cells and in turn to preserve freshness and taste. The finer the sharpness, the tastier both fresh and prepared food. 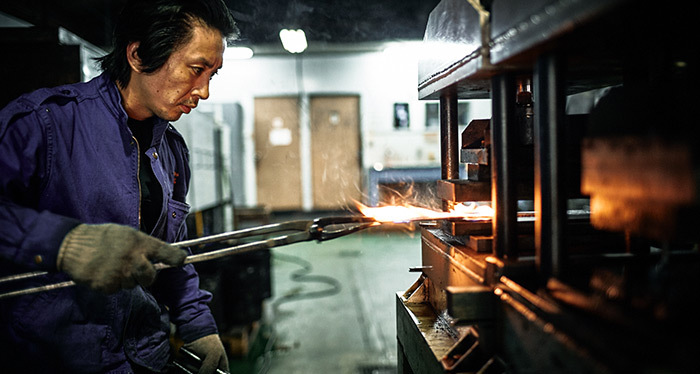 The entire technological process of manufacturing knives in Japan is therefore driven by the goal of creating the sharpest possible blade, which depends on the selection and treatment of the steel. And it was the very properties of steel that were the key to advancements in the 10,000-year-old tradition of making knives. 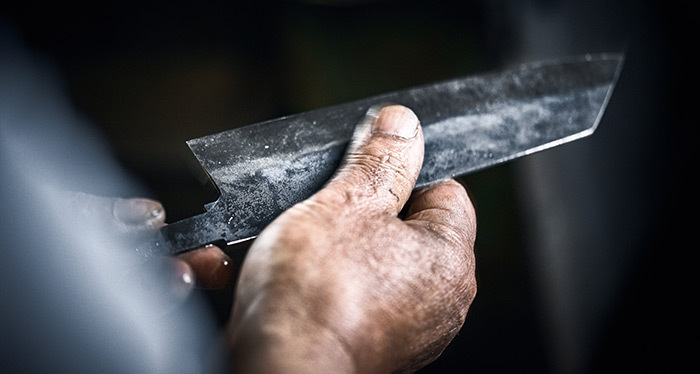 The main purpose when selecting the steel to manufacture a knife is to ensure the longterm sharpness of the final product. 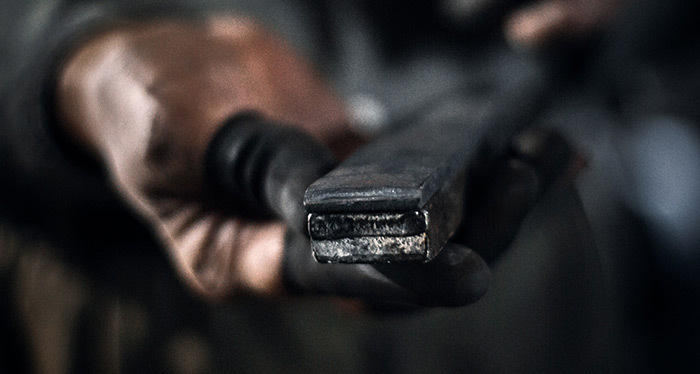 One of the most important steps is to determine the suitable steel strength in order to find the right balance between minimum sensitivity and maximum sharpness. In recent years, along with traditional Japanese steel such as shirogami and aogami, technologically advanced tool steel has emerged. This steel considerably improves the properties of the final product as regards hardness and the ratio of carbon to chromium, which a ects the durability of the sharpness as well as the corrosion of the blade. An example of such steel is ZDP-189 steel, which is distinguished by its extraordinary properties. 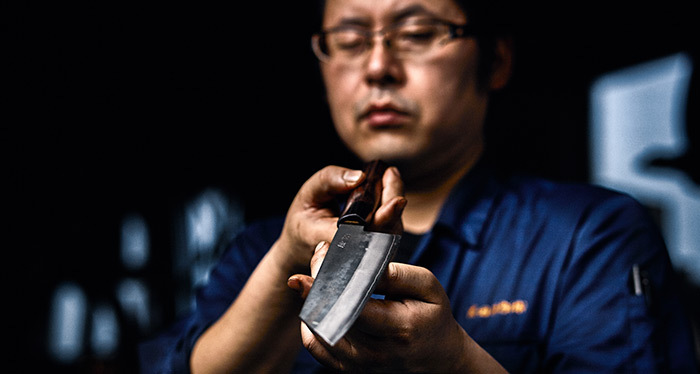 The knife is manufactured at the smithery of Yoshida Hamono in Japan, a family company with an age-long tradition in manufacturing state-of-the-art tools and Japanese swords, i.e. 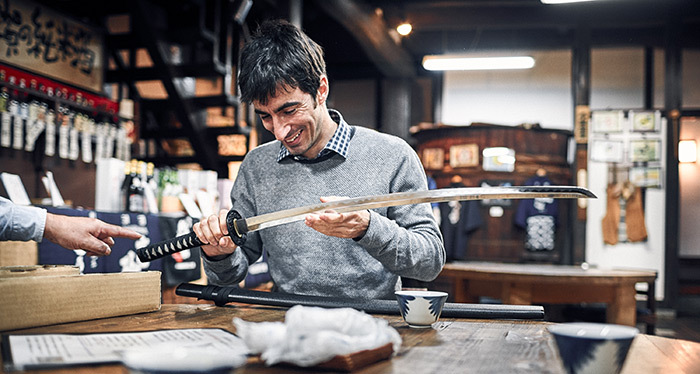 katanas, by hand. 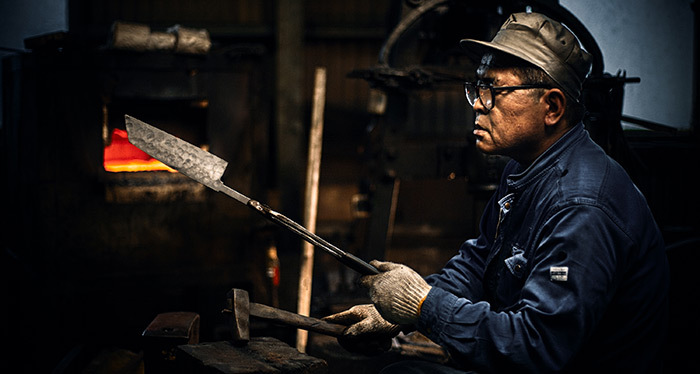 Yoshida Hamono has a great deal of experience forging ZDP-189 steel in the traditional manner. 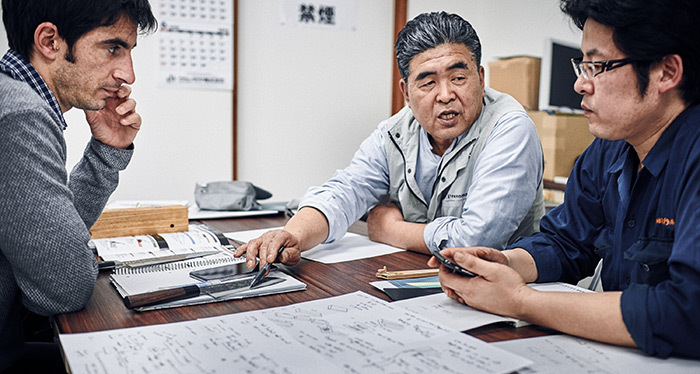 The master carefully developed the plan for treating ZDP-189 steel in accordance with the guidelines of the manufacturer, Yasugi Specialty Steel, a subsidiary of the well-known steel company Hitachi Metal, and continued to improve this method based on his experience gained over years of working with this steel. The process begins by heating the laminate, which has been prepared in advance. Laminating ZDP-189 steel is a very demanding process; therefore master Osamu-san first prepares one common laminate on large presses and cuts it into smaller pieces before treating it. 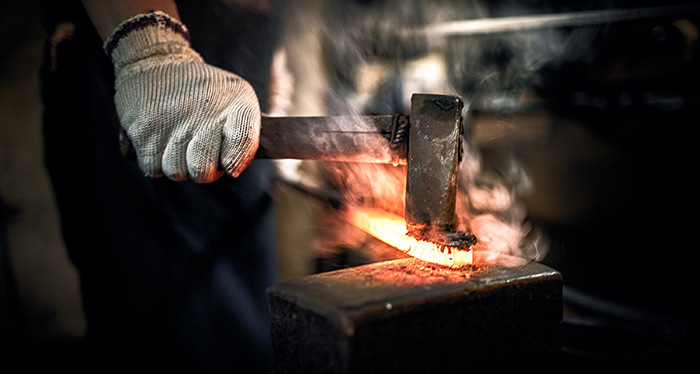 By correctly forging the steel, he adjusts the size of the particles therein, which makes the steel more homogeneous and gives the final product a finer sharpness. A knife made by forging is significantly stronger than a knife that has been cut because the flow of particles remains continuous. 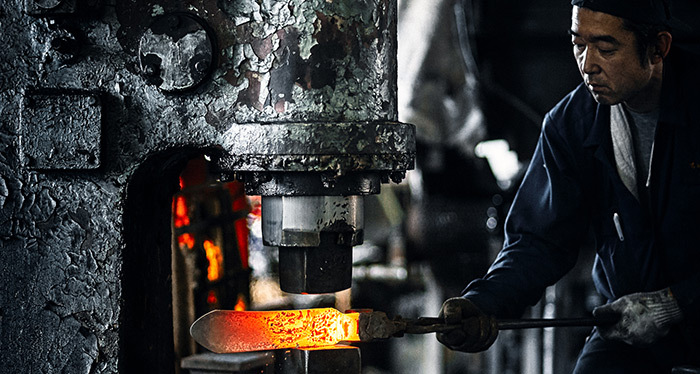 The forging starts by alternating heating and treatment of the steel with large pneumatic hammers. 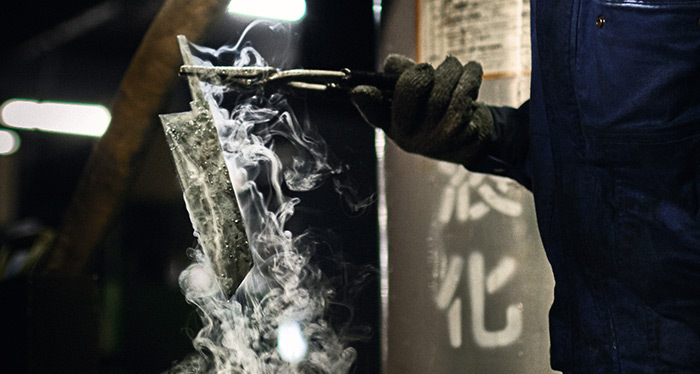 In the final stages of the process, increasingly more hand forging is involved and the final impressions of master Osamu’s forging are visible on the blade. Heat treatment considerably influences the properties of steel. Thermally treating ZDP-189 steel is very demanding due to the fact that extreme precision as to the temperature and timing of heating and cooling is required. First, rapid cooling in oil is required, and then the blade is inserted into a press in order to reduce certain stresses. Slow heat treatment reduces the tension in metal, achieves a more homogeneous carbide distribution, and ensures a more robust blade. Cooling in liquid nitrogen (-196oC). Furnace and temperature control. Controlled and gradual warming to room temperature is needed. Heat treatment produces steel with a hardness of 65-67 HRC. 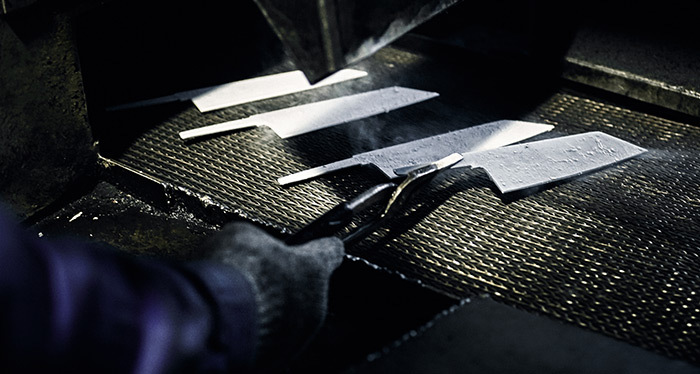 Heat treatment of the blade. Attaching a traditional Japanese handle made from palisander, i.e. rosewood. The steel is laminated, which entails that the core is made of very strong steel covered with an external layer of softer stainless steel. Such a blade remains sharp for a very long time, its softer external layer makes it easier to sharpen, and it also protects the core steel from external factors. With its typical functionality, the Bunka Bano-Bocho (文化 万能-包丁) design is intended for versatile use in Western cuisine. It has a flexible profile that is wide enough at the handle, a gently designed belly of the blade suitable for making either long or short cuts, a flat back side of the blade, and a thin tip for precise work with food. The heart of the knife is made of ZDP-189 steel, which we selected because systematic testing has proven its superior qualities and long-lasting sharpness. 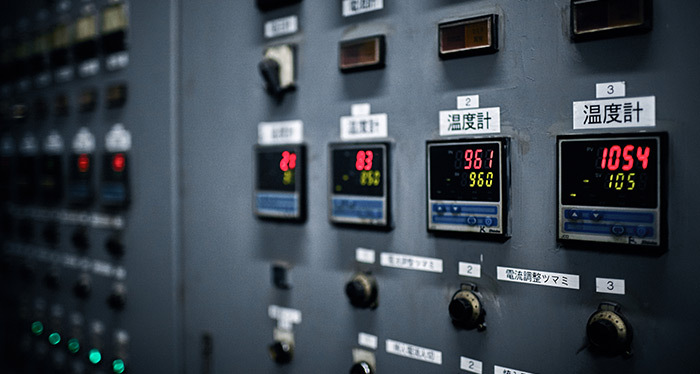 ZDP-189 – The steel contains as much as 3% Carbon (C), which is one of the main elements contributing strength and typically found in amounts of up to only 1% in other types of solid steel, while the Chromium (Cr) content, which prevents corrosion, amounts to nearly 20%. It also features 1.5% Tungsten (W), which considerably increases the abrasion resistance of steel, 1.3% Molybdenum (Mo), which helps to preserve the strength and power of steel under variable temperatures, and 0.10% Vanadium (V), the key element in increasing steel strength. 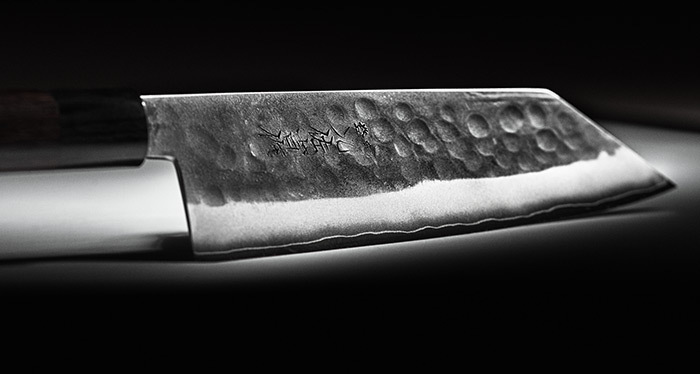 The Kuro-uchi finishing of the blade, which is untreated at the tip and has an already-developed dark patina, protects the blade and gives it a traditional Japanese look. The knife bears visible impressions of the hand-forging process, which gives it a beautiful finish and also prevents food from sticking.